Click here for adult sizing.. 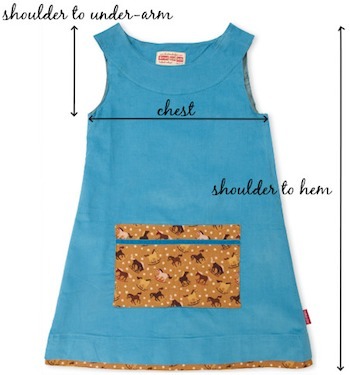 The information below lists the dress dimensions in cm, to help you chose the best size for your little runaway, or your pick-a-pocketeer. Our current sizing ranges from 2 to 8 years. Please note, as of Autumn / Winter 2010 (i.e. current Pick-a-Pockets), we have increased the length on our dresses due to popular demand - Summer 2011 will also be longer than our current Runaway dresses.